Reliable. Proactive. Professional. Our team has been hard at work for more than 20 years maintaining some of the most beautiful landscapes in the region. Starting in 1989, founder Earnest Clark had a singular focus on providing truly professional grounds maintenance when most of the market was dominated by part-time operators. As most companies started to outsource exterior work Clark saw a demand for a commercial contractor that provided not only corporate-level landscape maintenance and installation services but was a resource for other exterior services such as tree work, irrigation maintenance, and snow removal. A small number of these services needed to be subcontracted out, but Clark understood that this allows property and facility managers to make one call. With the support of longtime customers Clark has grown from a one-man operation to a company with 2 offices and more than 25 employees providing service to central and southwest Virginia. 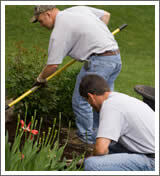 To create beauty in landscaping and always provide quality work and unequaled service. Our professional staff is trained to provide your company with a comprehensive lawn care and maintenance program. Only specially trained and state-licensed employees are permitted to make chemical applications. All our employees are required to wear a company uniform and perform in a workman-like manner in accordance with standard practices. Clark Landscaping and Lawn Care is constantly striving to provide you with sound horticulture advice, offering design possibilities and going out of our way to understand and meet all of your requirements. We provide professional landscape installation and regular inspection of trees and shrubs. Our inspections allow us to provide pesticide applications, pruning, mulching, and proper site maintenance in a timely fashion. Our mulch is applied using our new Finn mulch-blowing system. This system allows us to save both time and material, savings we pass on to our customers. Regular monitoring of each property by our knowledgeable managers ensures that each property meets our strict aesthetic guidelines.